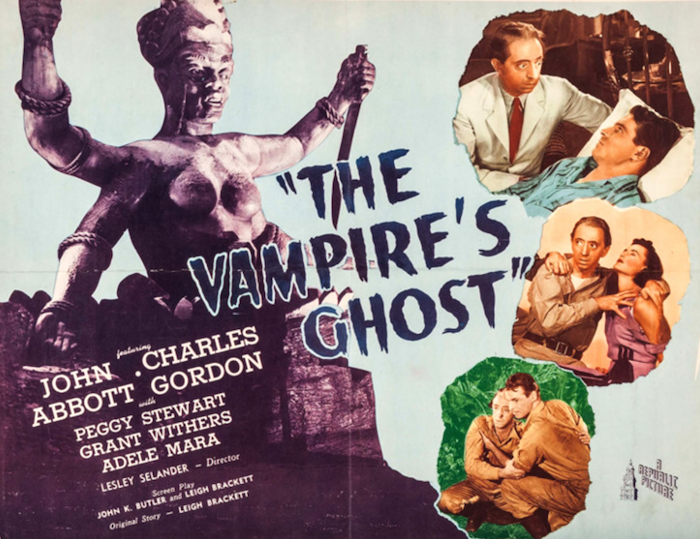 DVD/Blu-Ray News #146: The Vampire’s Ghost (1945). Neither Republic Pictures nor director Lesley Selander made many horror movies. Which makes The Vampire’s Ghost (1945) something worth seeking out. Add to that the fact that it’s got both Peggy Stewart and Adele Mara in it, with a story from the great Leigh Brackett, and it’s not to be missed. The Vampire’s Ghost is making it way to DVD and Blu-Ray thanks to Olive Films in time for Halloween. DVD/Blu-Ray News #97: The Man Who Died Twice (1958). This is an update to a post from way back in January. Naturama was Republic’s widescreen process, and Vera Ralston was the figure-skater girlfriend/wife of Republic’s president, Herbert J. Yates. Guys like Rod Cameron, Sterling Hayden and even John Wayne appeared with her, grudgingly. And when Republic shut down, do did Ralston’s career. That said, she made some pretty cool movies, and The Man Who Died Twice (1958) is one of them. In fact, it was her last — the studio tanked that year (it’s also the last Republic Joe Kane directed). It’s a low-budget crime/noir thing. Rod Cameron’s cool in it (as always), Luana Anders plays a heroin addict, and Jack Marta shot it in black & white widescreen. Sounds terrific, don’t it? 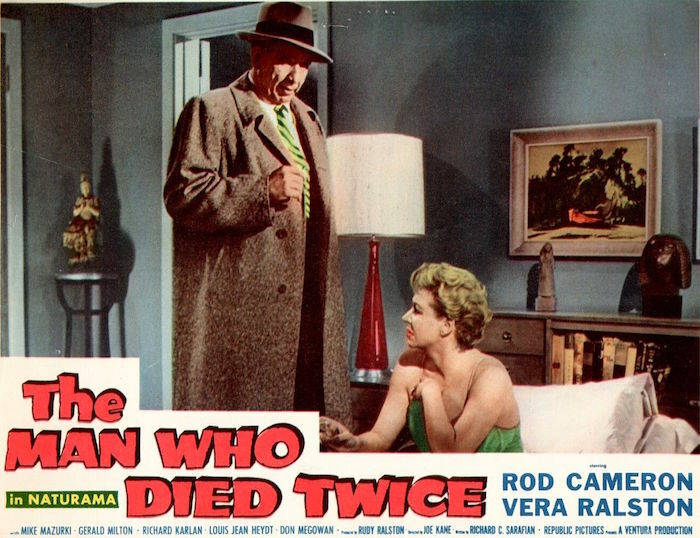 Kino Lorber will bring The Man Who Died Twice to both DVD and Blu-Ray in November. For decades, seeing Republic Naturama movies in their original 2.35 aspect ratio has been damn near impossible, so this release is a real treat (and hopefully the first of many). The transfer’s excellent — got a good look at it while working on a commentary for it. Recommended. 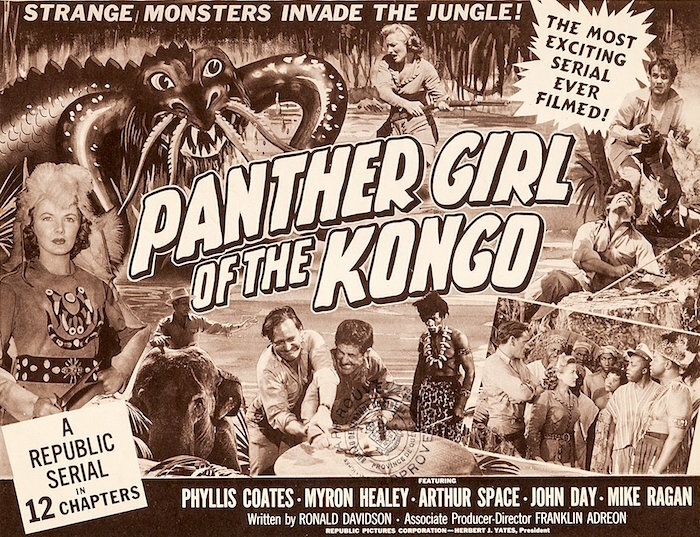 DVD/Blu-Ray News #101: Panther Girl Of The Kongo (1955). 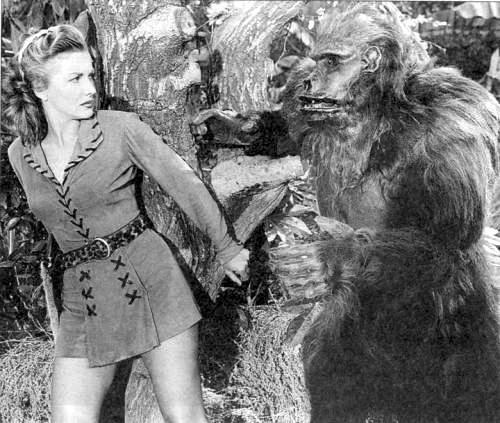 The next-to-last Republic serial, Panther Girl Of The Kongo (1955), is coming to DVD and Blu-Ray from Olive Films. Stock footage was the order of the day in the final years of Republic serials, and this one lifts liberally from Jungle Girl (1941) starring Frances Gifford. What really sets Panther Girl Of The Kongo apart are the always-terrific Phyllis Coates and the really cool giant crayfish (here in North Carolina, we call them crawdads). I guess Hollywood’s big bug trend (Them!, Tarantula, The Deadly Mantis, The Black Scorpion) infested the Republic lot — and it’s all brought to life by the genius of Howard and Theodore Lydecker. They built scale jungle “sets” and turned real crayfish loose on them. It all makes for a really fun serial that comes highly recommended. UPDATE 2/10/17: Amazon has this available for pre-order at just $12.99! 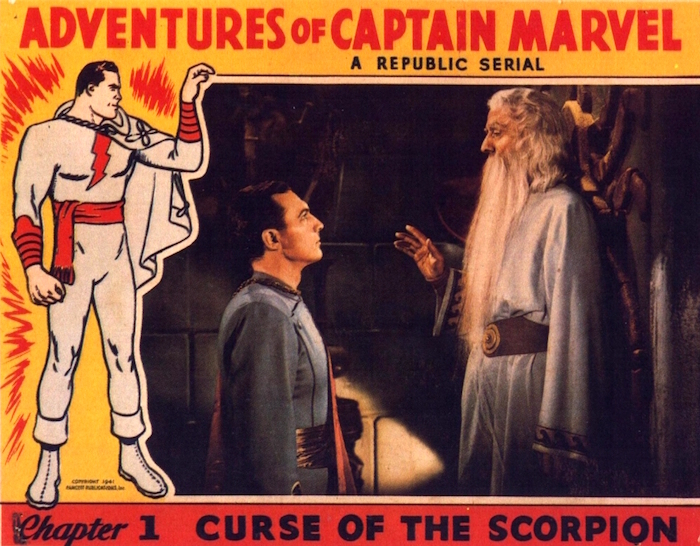 DVD/Blu-Ray News #92: Adventures Of Captain Marvel (1941). Republic’s Adventures Of Captain Marvel (1941), maybe the greatest serial of them all, is coming to Blu-Ray from Kino Lorber in early 2017. Shazam! Across its 12 chapters, Howard and Theodore Lydecker, two of my all-time movie heroes, give us all kinds of tremendous special effects — Captain Marvel’s flight, typhoons, volcanoes, explosions, ships and on and on. William Witney and Republic’s team of stuntmen work their usual magic in a number of great fights. This thing really delivers the goods. I can’t imagine a serial fan who hasn’t seen this one, so I don’t really need to recommend it. You know how absolutely essential it is. DVD/Blu-ray News #74: Daredevils Of The Red Circle (1939). Boy, the new releases are coming fast and furious these days. 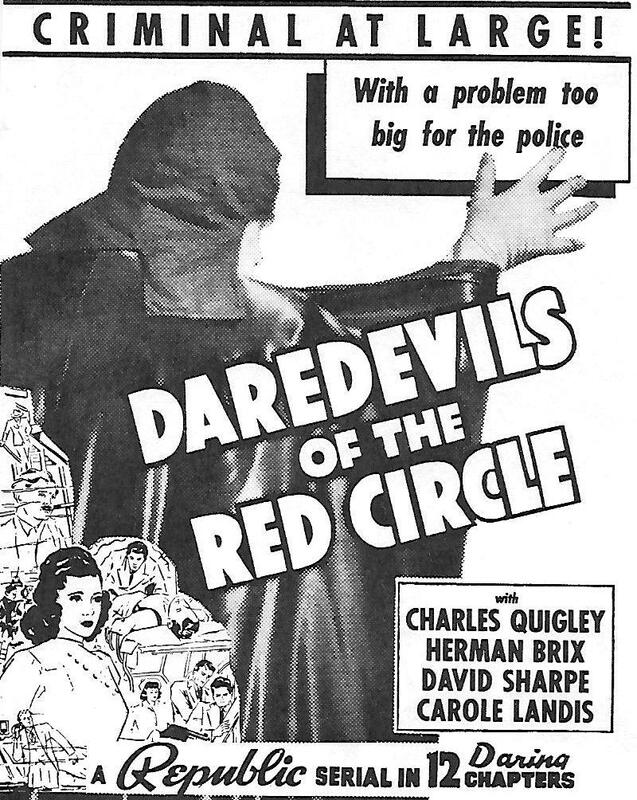 Here’s another, and it’s a really good one — Republic’s 12-chapter serial Daredevils Of The Red Circle (1939) is coming from Kino Lorber (not sure on the date). Serial nuts often list this as a favorite, and for good reason. It’s terrific. The Republic Pictures Blogathon: Radar Men From The Moon (1952). This is an entry in The Republic Pictures Blogathon, a celebration of the studio’s incredible talent roster, wonderful output and lasting legacy. No one signed on for a Republic serial, and I wanted to make sure they were represented. 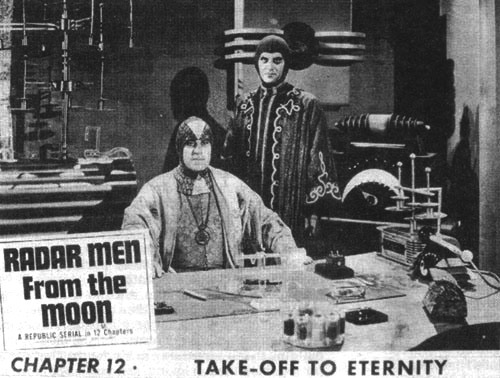 One of the last Republic serials, Radar Men From The Moon (1952) is a real hoot. It leans heavily on stock footage from previous Republic pictures and recycles the flying suit from King Of The Rocket Men (1949). 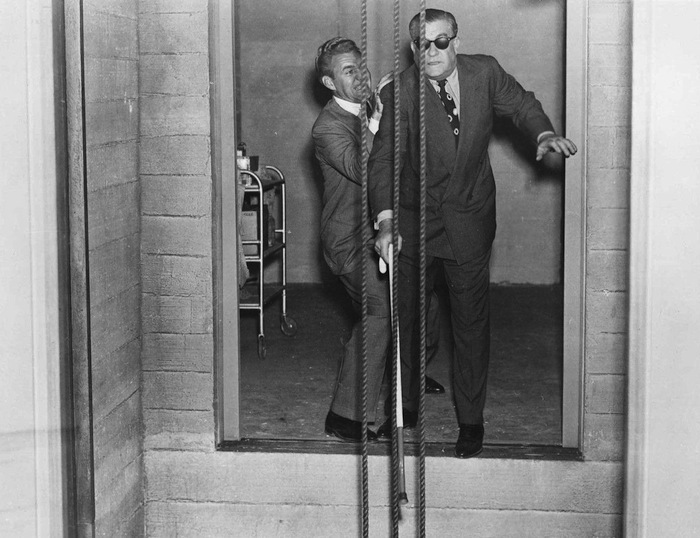 It introduces a new character — Commando Cody, played by George Wallace — and features Clayton Moore, between stints on The Lone Ranger, as a bad guy. This serial features one of my all-time favorite movie plot points: aliens enlisting American gangsters to help with their plot to conquer the earth. Moore is one of those gangsters. 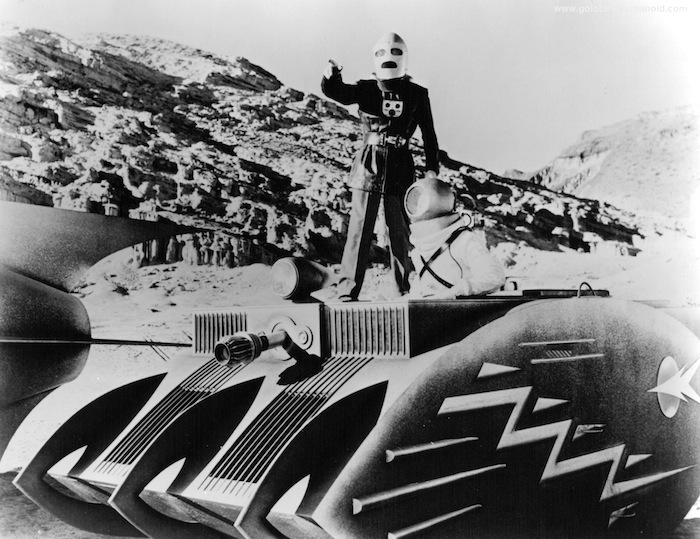 Retik (Roy Barcroft), ruler of the moon, is using an “atomic ray” to destroy strategic locations in the United States. 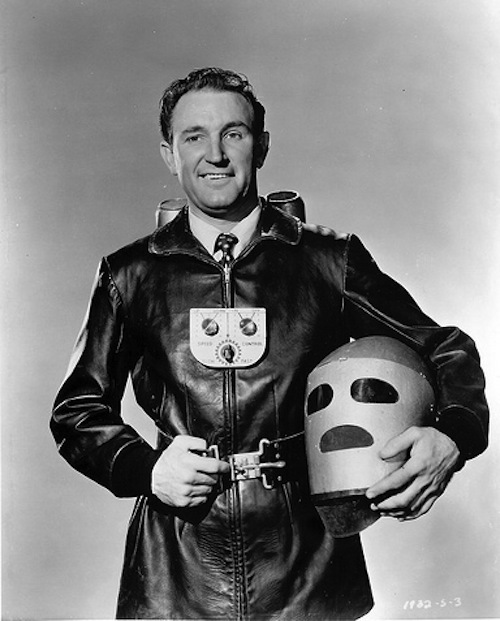 Commando Cody (George Wallace), an inventor-adventurer with a spaceship and a flying suit, heads to the moon to investigate. Soon, he and his cohorts are battling Retik and Krog — and gangsters like Graber (Clayton Moore), both on the moon and around L.A. There are 12 chapters of this crazy stuff, and it’s goofy, delirious fun. Maybe not so much fun for the cast and crew, however. Other locations include Vasquez Rocks, the Iverson Ranch and the train station in Chatsworth (which I assume was close to Iverson). Republic’s frantic pace of production didn’t even slow down when Moore broke Wallace’s nose. A few minutes after returning from the ER, Wallace was back in front of the camera, a bloody towel waiting just out of the shot. Dialogue scenes have a first-take quality to them. The actors don’t seem comfortable with the words coming out of their mouths. But they keep it moving from action scene to action scene, and from chapter to chapter — and that, of course, is what a Republic serial is all about. 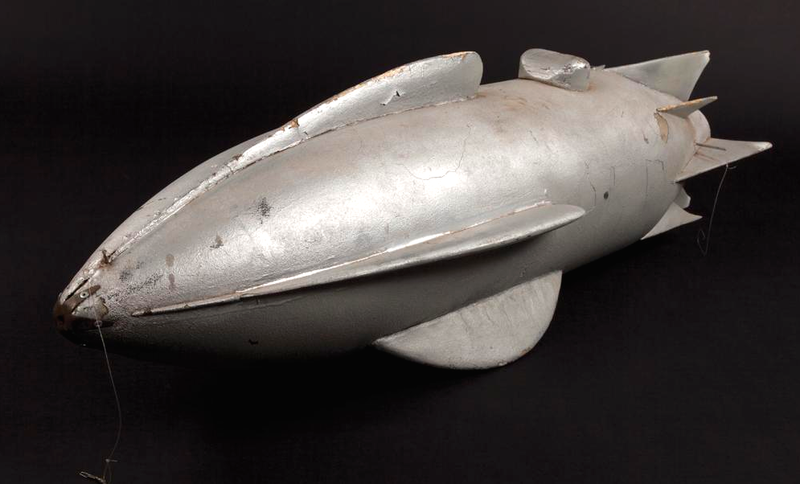 The Lydeckers’ model spaceship for Radar Men From The Moon. For me, one of the appeals of any Republic serial is the promise of some first-class model work from Howard and Theodore Lydecker. Here, we’ve seen a lot of their stuff before. But we get some great rocket shots, Cody’s flying scenes and the awesome moon tank. 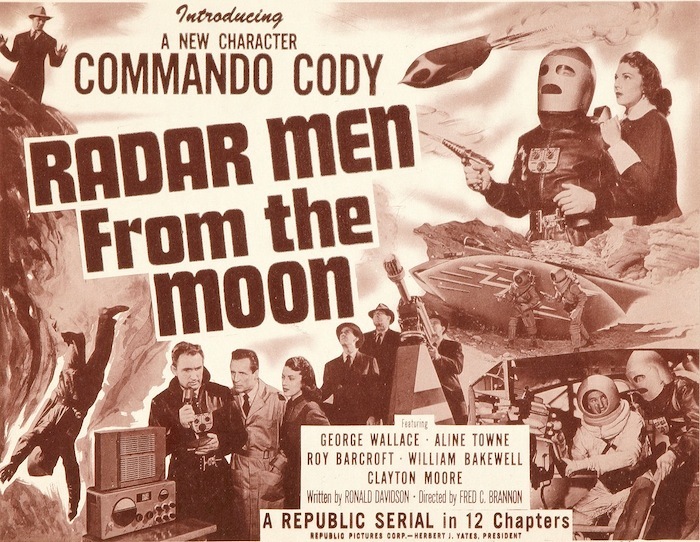 Radar Men From The Moon wouldn’t be the last of Commando Cody. A second serial, Commando Cody: Sky Marshal Of The Universe, followed. It was originally produced as a TV show, with 12 25-minute episodes — in sequence but with no cliffhangers. Union rules required that it go to theaters first. Again, it features a lot of stock footage. This time, Cody is not played by George Wallace. To be honest, Radar Men From The Moon can’t hold a candle to some of the great, early Republic serials. But it’s so fast — all 12 chapters run just a bit over two-and-a-half hours — and so much fun, I’ve always found it irresistible. What’s more, it’s readily available on DVD from various sources, though a Blu-ray would be appreciated (as a hi-def Lydecker Bros. demo reel, if nothing else). 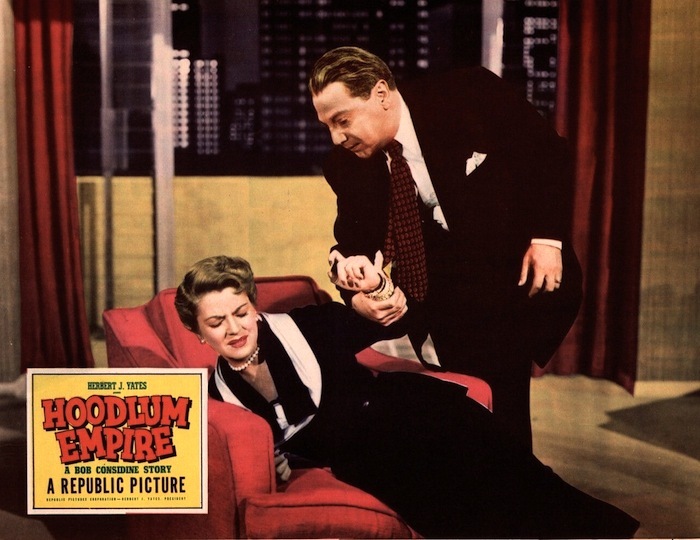 The Republic Pictures Blogathon: Hoodlum Empire (1952) By Guest Blogger Jerry Entract. 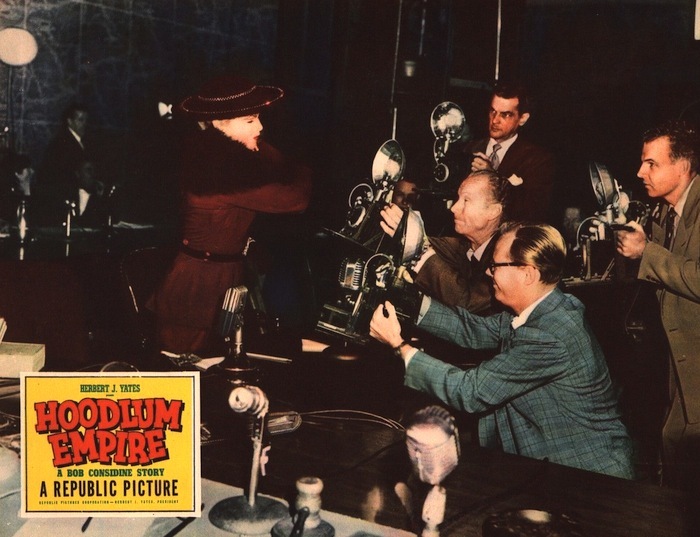 I am delighted to be able to take part in a “Republic Pictures Blogathon” and would like to thank our host, Toby, for making it possible. Right from the start, Republic were making a cross-section of film types even though their specialty was the Western. 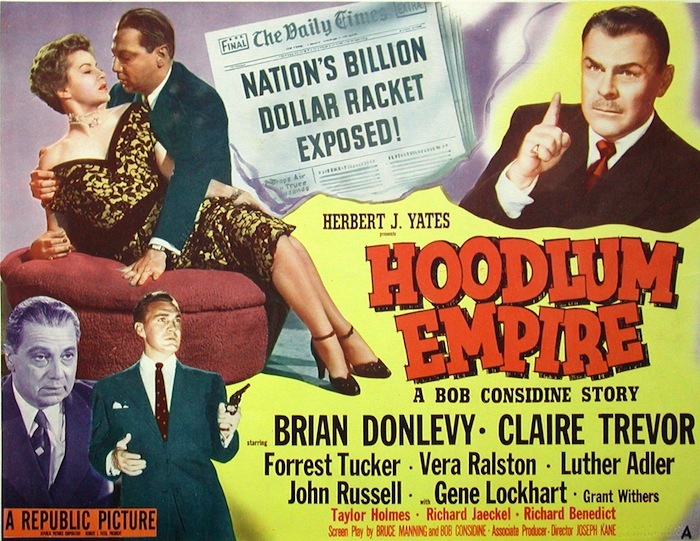 1950-51 saw the Kefauver Committee set up in the U.S. Senate to tackle organised crime all across the U.S. To reflect this, Republic filmed Hoodlum Empire (1952), though naturally names were changed. Journalist and author Bob Considine wrote the story on which the screenplay was adapted by Bruce Manning and Considine. The background to the story is the testifying to a Senate committee of various figures known as underworld leaders. Brian Donlevy plays the leader of the committee, determined to go after these crime lords, led here by Luther Adler and his vicious No. 2, Forrest Tucker. However, although he is listed sixth in the cast, the real central figure is John Russell, who is Adler’s nephew and had been heavily involved in crime pre-WW2. His wartime experiences have turned him around, however, and since 1945 he has been running a legit business. Adler and co. are determined to implicate him in criminal activity and thereby fade their own (real) involvement into obscurity. In the end, they do not succeed. This is, of course, far away from the Western and yet the central theme is John Russell’s redemption (with the help of a good woman) — a strong Western motif, particularly throughout the 50s. Also, the director is Joseph Kane, Republic’s No. 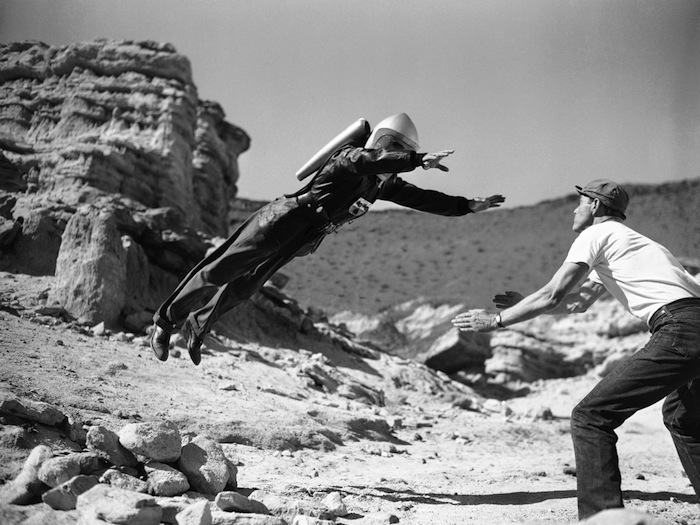 1 go-to man for action, having by this point helmed countless Autry and Rogers films. I even recognised the house used as John Russell’s family home as being “The Duchess’ Ranch” from the 1944-46 Red Ryder series, now tarted up with ‘modern’ frills like a picket fence and trees. I found the script to be both literate and adult, and the cast just fine at putting it over. Claire Trevor in particular showing a vulnerable woman beneath her tough and wisecracking front, something she was skilful at doing. Grant Withers, also in the supporting cast, came across very well. He and Roy Barcroft appear, both regular Republic Western baddies, as well as Douglas Kennedy and John Pickard (both uncredited). So… a lot of familiar and welcome faces in the quite large cast. Seeing John Russell here again makes me wonder why he didn’t achieve greater stardom than he did. For folks who like a good gritty crime drama with a great cast, this film would get my recommendation. It’s readily available on DVD in the US and elsewhere. That is regrettably not true of all too many of Republic’s crime dramas (they didn’t do ‘noir’ so much) which are locked away in the vaults and kept from film fans hungry to see them.